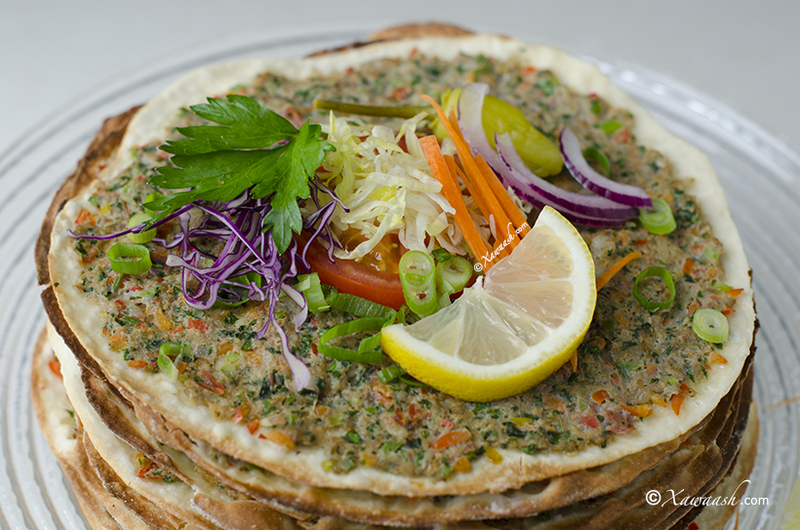 We received several requests from our Somali viewers asking us to prepare a dish from Turkey. The Turkish government and its people have helped Somalia in its hour of need and they are still helping. Somalis are grateful for this much-needed help and it is for this reason that we dedicate this post to the friendly people of Turkey and their government. 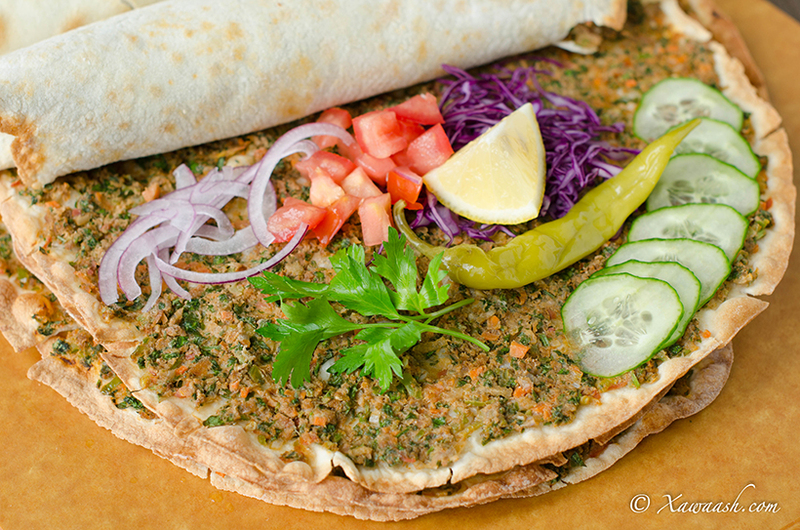 Lahmacun (pronounced lah-ma-june) comes from the Arabic lahm-be-ajeen (لحم بعجين) which means “meat with dough”. 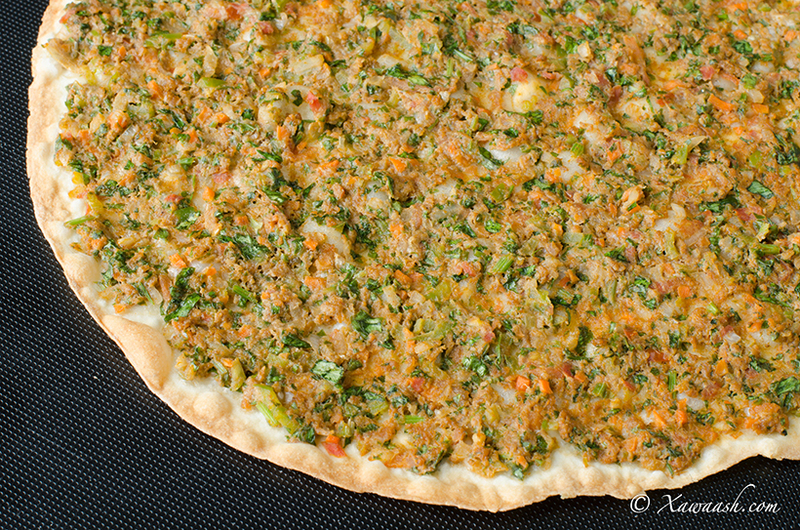 It is very popular in Turkey, and some know it as Turkish pizza. 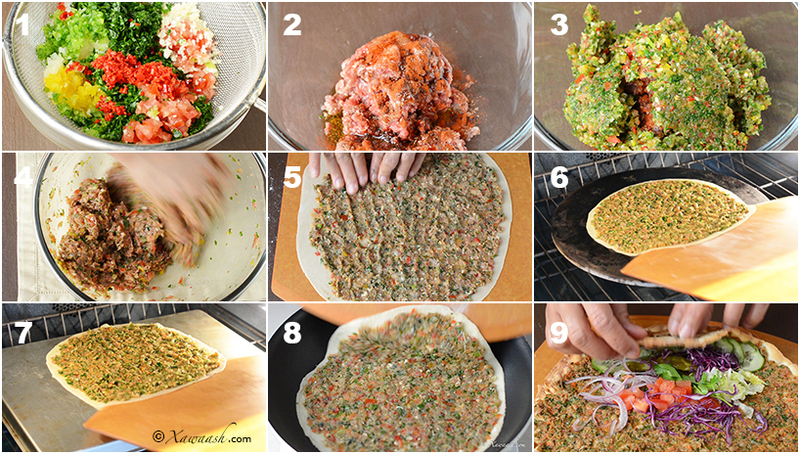 This “pizza” has no cheese and the topping is a mixture of spicy meat and minced vegetables. It is usually served with fresh parsley and a good squeeze of lemon juice. 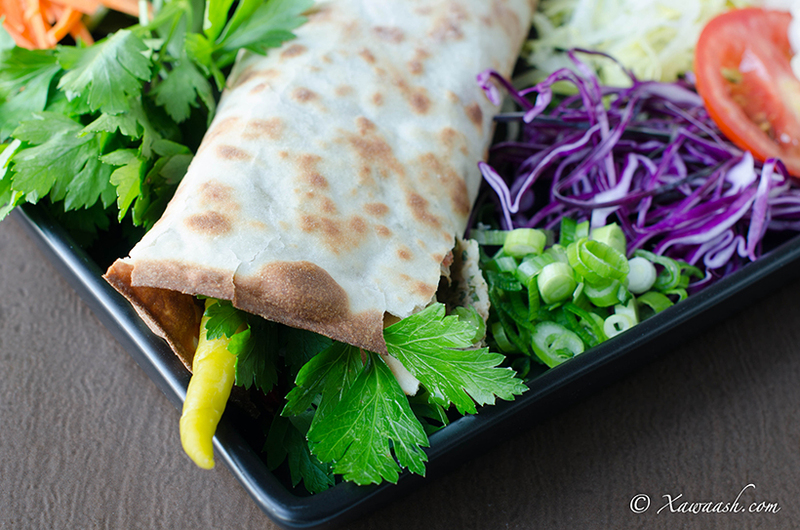 It is also rolled up with a salad topping that makes it not just tastier but also very healthy. 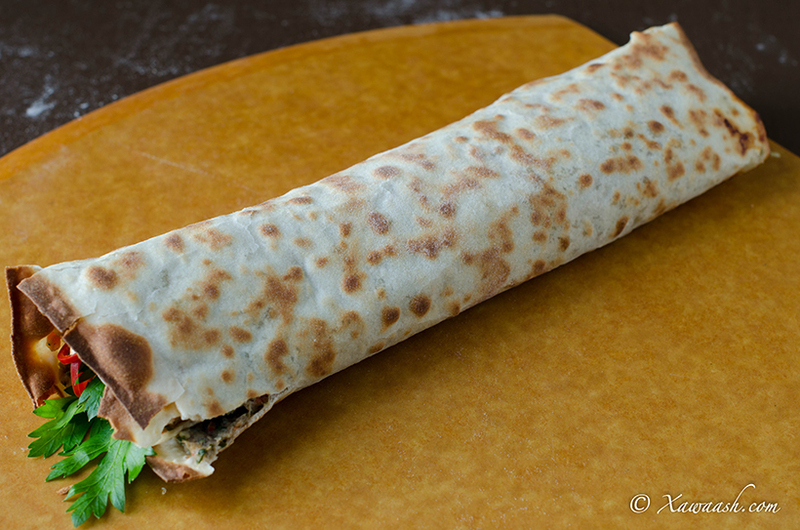 Freshly-baked lahmacun is thin and crispy and is not easy to roll. They become easy to roll when they cool down. If you spread out the dough very thin like it should, do not bake at an oven temperature that is higher than 450F/230C, otherwise the dough will over-brown before the meat reaches a safe temperature. 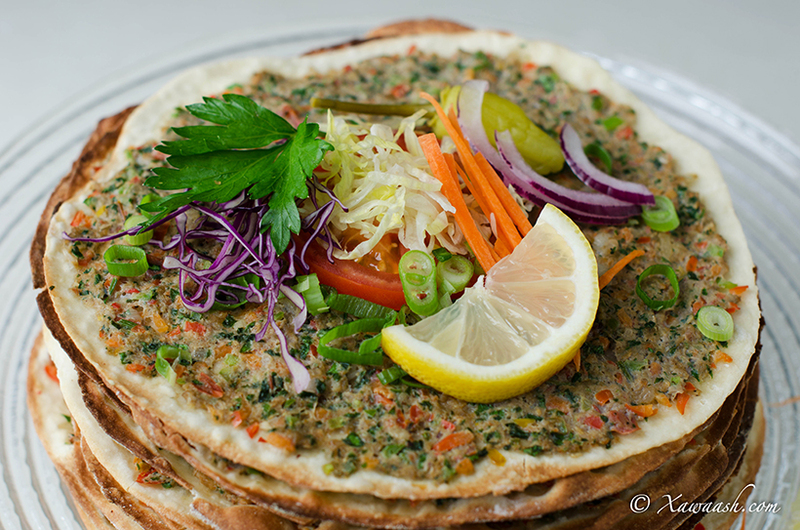 We have gotten good results by cooking the lahmacun in a frying pan on the stovetop. 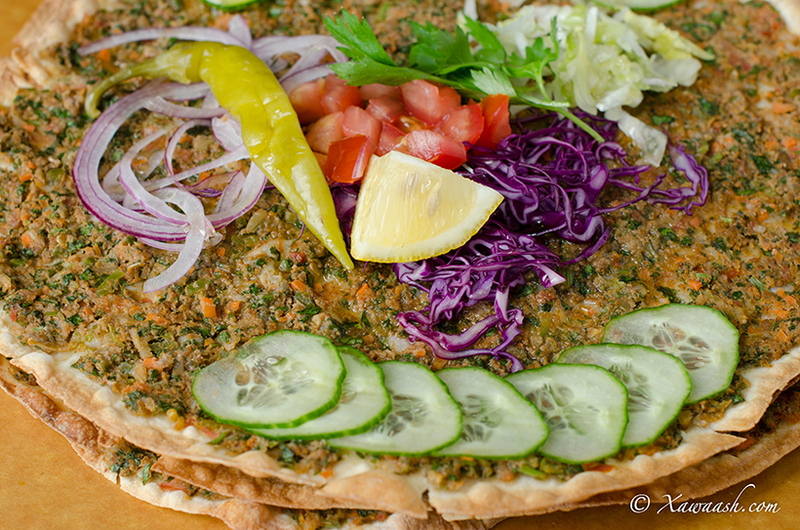 The lahmacun was crunchy and the meat topping was not dry. 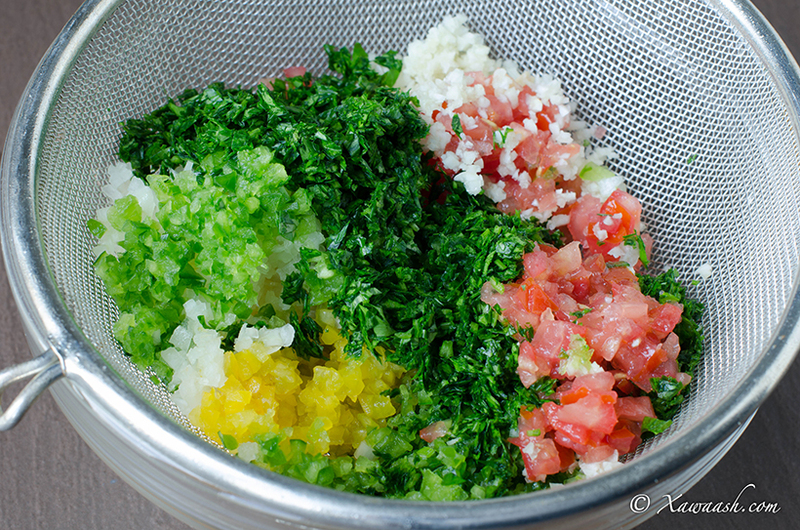 Mince the vegetables and place in a sieve or colander. 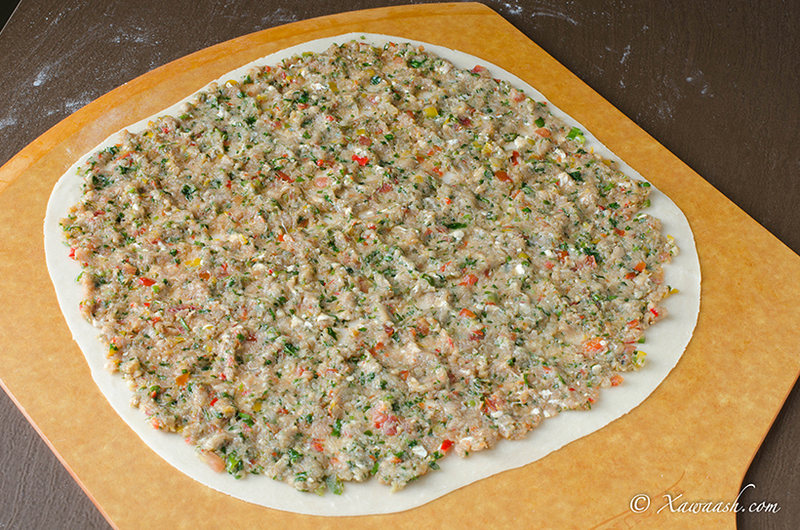 Bake it in a preheated oven at 450°F/230°C on a pizza stone for 6 minutes. You can also bake it using a baking sheet. You can use a frying pan to cook it. Using medium heat, cook uncovered for 3 minutes then lower the heat and cover and cook for 4 minutes. Lastly, uncover and cook for a further 2 minutes. Isku dar burka, cusbada, sokorta iyo qamiirka. Biyaha ku kor shub qamiirka, kaddibna muddo 2 daqiiqo sug si uu qamiirka u kaco. Saliidda ku dar, kaddibna cajiinka rifaaq muddo 10 daqiiqo. Cajiinka dabool oo dhig muddo 1 saac si uu u qamiiro. Cajiinka u qaybi 6 ama sagaal gabal (cabbirka aad jeceshahay). Si fiican u fidi, qafiifna ka dhig. Qudaarta aad u yaryareey, kuna rid miire. Isku dar hilibka, cusbada, filfisha madoow, babriikada, iyo saliidda oliifada. Haddaad doontid, ku dar yaanyo shiishiid iyo sirabka rummaanka. Qudaarta iyo hilibka isku dar. Hilibka iyo qudaarta isku jira u qaybi cajiinka aad fidisay. Ku dub foorno la sii kululeeyey kuna jiro dhagax biitso 450°F/230°C muddo 6 daqiiqo. Waxaa ku dubi kartaa foorno la sii kululeeyey oo ay ku jirta birta foorno 450°F/230°C muddo 6 daqiiqo. Haddaad doontid waxaa ku dubi kartaa birtaawo. Dab dhexdhexaad ah isticmaal ilaa uu laxam bicajiinka salka ka gaduuto muddo 3 daqiiqo. Kaddib, dabka aad u gaabi, dabool oo dub muddo 4 daqiiqo. Marka u dambeysa, daboolka ka qaad oo dub muddo 2 daqiiqo. Ku qaddin qudaarta aad jeceshahay. Laxam bicajiinka waa la duubaa oo looma cuno sida biitsada. Nous avons reçu plusieurs demandes de la part de nos lecteurs Somalis qui souhaitaient que nous préparions un plat de Turquie. Le gouvernement Turc et son peuple ont aidé la Somalie dans les moments difficiles et le font encore aujourd’hui. Les Somalis sont reconnaissants pour cette aide plus que bienvenue et c’est pour cette raison que nous dédions ce post à nos généreux amis les Turcs et leur gouvernement. 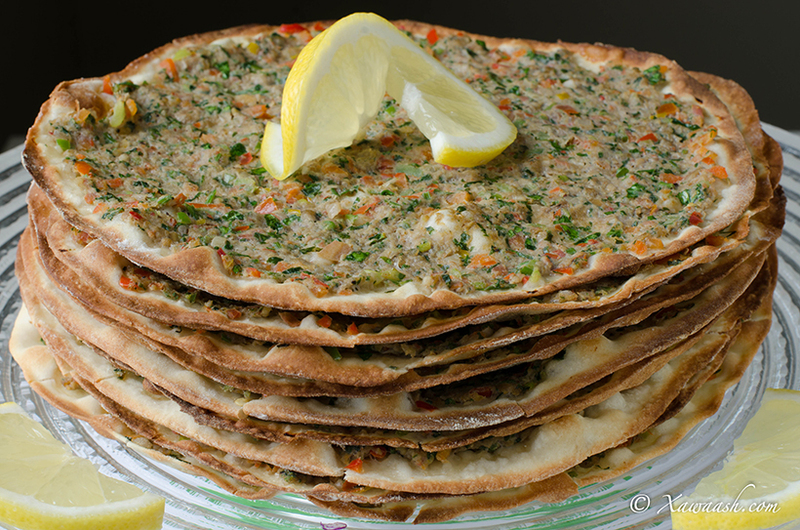 Lahmacun (prononcé lar -ma-djoune) vient de l’arabe lahm-be-ajeen (لحم بعجين) qui signifie “viande avec de la pâte”. 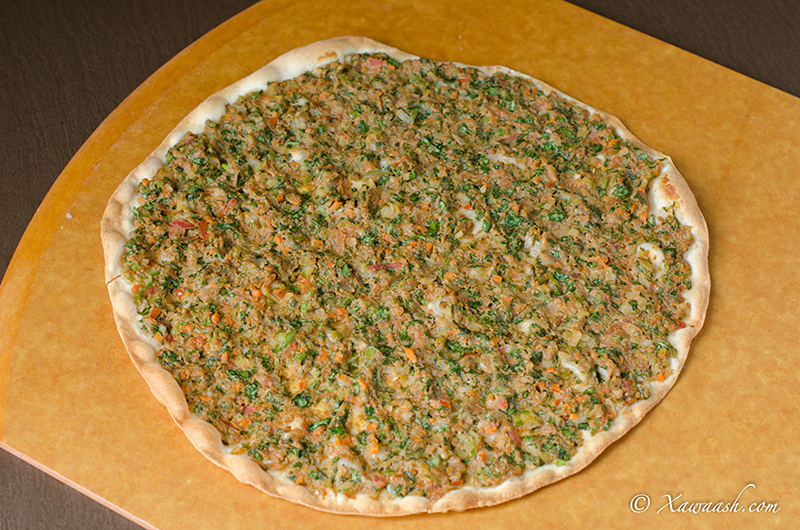 Ce plat est très populaire en Turquie, et certains le connaissent sous le nom de pizza turque. Cette “pizza” ne contient pas de fromage et sa garniture est un mélange de viande épicée et de légumes hachés. Il est souvent servi avec du persil frais et une giclée de jus de citron. Il se mange aussi roulé, garni de crudités ce qui le rend non seulement plus savoureux mais aussi très sain. 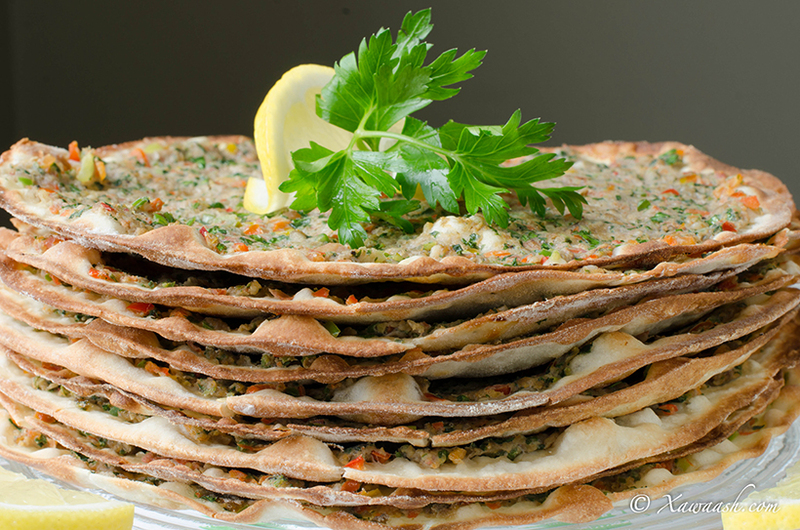 Le lahmacun fraîchement cuit est fin et croustillant et difficile à rouler. Il devient plus facile à plier quand il refroidit. Si vous étalez la pâte très fine comme il faut, il ne fait pas la cuire au four à plus de 450°F/230°C, sinon la pâte va noircir avant que la viande atteigne la température nécessaire. 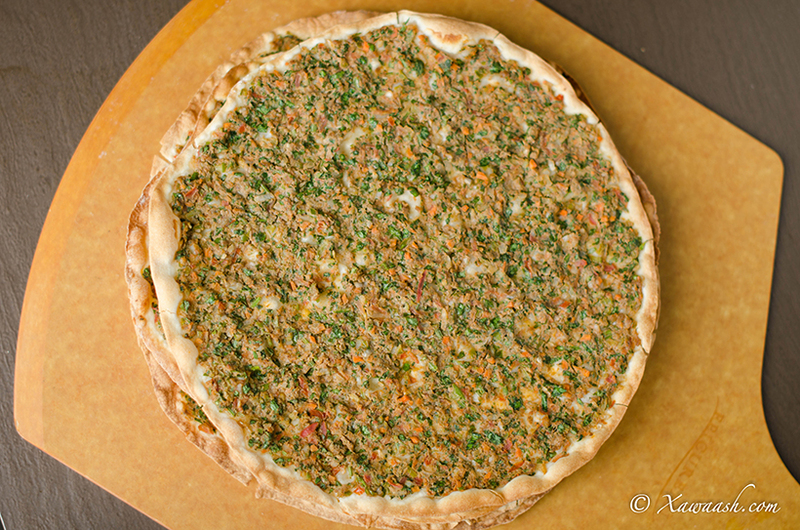 Nous avons obtenu de bons résultats en cuisant les lahmacun dans une poêle sur la cuisinière. Les lahmacun étaient croustillants et la garniture de viande n’était pas sèche. Mettre de la farine dans un bol. Creuser un puits et ajouter la levure. Ajouter le sucre et le sel, puis verser l’eau et laisser la levure s’activer pendant 2 minutes. Ajouter l’huile, puis mélanger tous les ingrédients et pétrir pendant 10 minutes. Former une bûche avec la pâte et la diviser en 6 morceaux pour de grands lahmacun, ou 9 morceaux pour de plus petits. 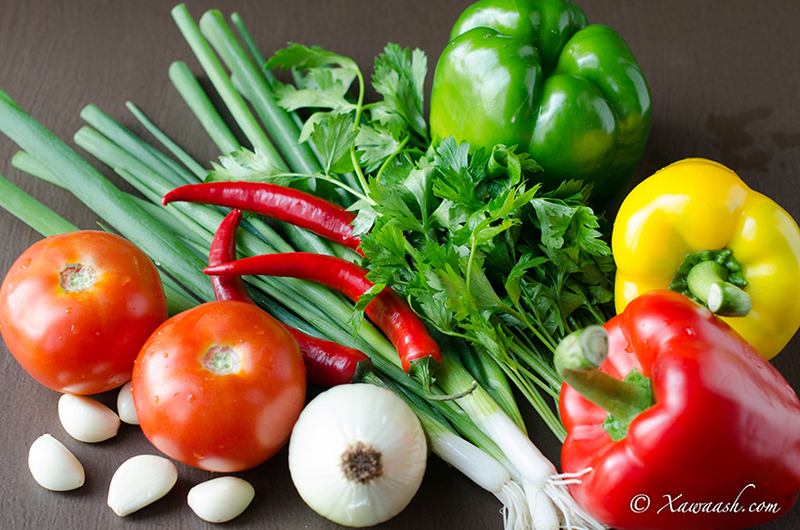 Hacher les légumes et les mettre dans une passoire. Mélanger la viande, le sel, le poivre noir, le paprika et l’huile d’olive. Si vous le souhaitez, ajoutez le concentré de tomate, le sirop de grenade et le sumac. Étaler une couche de garniture sur le dessus de la pâte. Cuire 6 minutes sur une pierre à pizza dans un four préchauffé à 450°F/230°C. Vous pouvez aussi les cuire sur une plaque. Vous pouvez utiliser une poêle à frire pour les cuire. Cuire 3 minutes sans couvrir sur feu moyen, puis baisser le feu, couvrir et cuire 4 minutes. Enfin, découvrir et cuire 2 minutes de plus. Ramadaan kariim walaal. Basbousada aan soo gelinay qumbaha ayaa loos ku beddelin kartaa. Waa ku mahadsan tahay faallada. Mashallah these look amazing! I’ve made something similar in the past, but I’d use pomegranate syrup and only the red bell pepper. Can’t wait to try these out, just hope my dough rolls out as well as yours. Thank you very much for your comment. We hope you will like them. Waan ku faraxsan nahay inaad ka faa’iidaysanaysid xawaash.com. 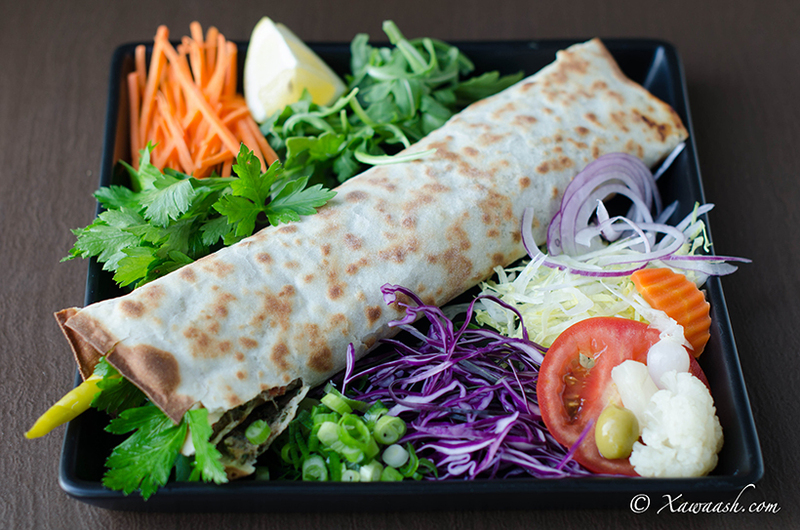 Lahmacun-kaan wuu ka duwan yahay midka Carabta. 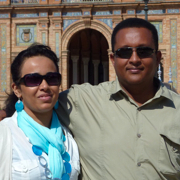 Nooca Lubnaan iyo Carabaha laga cuno waa kan, halkaan guji http://xawaash.com/?p=3706. Mahadsanid walaal. Waa barbarooniga iyo filfisha gaduudan inta la qalajiyey kaddibna la shiiday. Rumaan af Ingiriis waa (pomegranate), af Carabina waa رمان. Adigaa mahadda mudan walaal. Qayr ayaan kuu rajaynaynaa adigana. I would like to make this bread today and was wondering if I used whole wheat flour, would it come out as good? Can I use my kitchenaid mixer to kneed? Just bought a brand new one and love using it , seeing you two use it all the time made me buy one lol, might as well use it since I paid an arm and leg lol.. Thank you for all that you do . Thank you so much for your kind words. Congratulations for your new stan mixer. You made the right choice, and it makes life so much easier. The reason we started kneading by hand is that so others who don’t have a stand mixer would not be discouraged. You can use your mixer for ALL the recipes that require mixing, whipping and kneading. Thank you for the quick reply. So I made the bread and alhumdulilah it came out really good, hubby loved it. Only thing is I had to add more water when I was kneading and rolling it wasn’t so easy, had to use a lot of force. Also with using re mixer, what level do you knead and do you just put everything in there and turn the machine on? I am still getting used to using it . I kept it at 2. I apologize in advance for asking this silly question . It is OK to add extra water. We made the dough a little hard so it will be easy to lift and handle when placing in the oven. 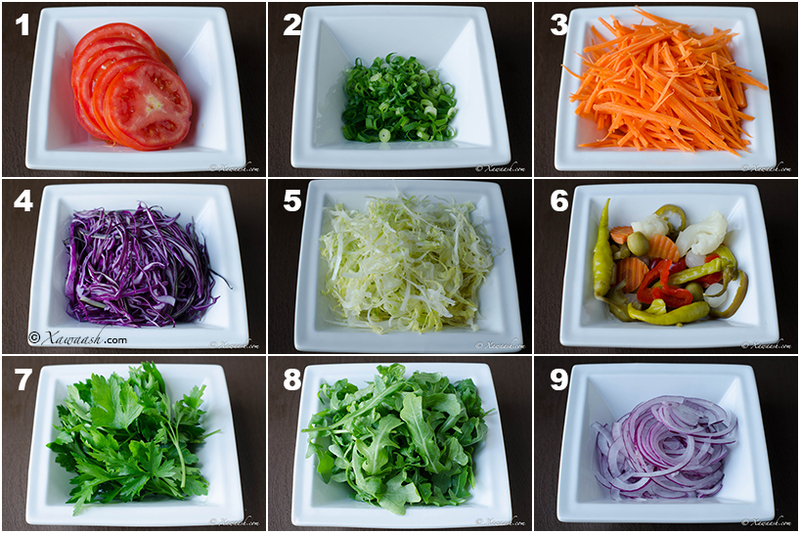 You can mix at level 2 or 3 for 5 minutes. You can put everything at one time and mix, but we prefer to activate the yeast so it will be incorporated better. Your questions are always welcome. Thank you. Adigaa mahadda mudan walaal. Aad ayaan ugu faraxnay inaad ka faa’iidaysanaysid goobta Xawaash.com. Qayr ayaan kuu rajaynaynaa. Mahadsanid. Adigaa mahadda mudan walaal. Kelmadda aad garanweydo inoo sheeg waan kuu micnayn doonnaa insha’Allaah. Qayr ayaan kuu rajaynaynaa. Mahadsanid. Thank you so much for posting all the lovely recipes, you do not even know how much i use your web side, it safe my daily hassle of think what should i make. i just go to your website and there you go i find everything i want to make it. If i ever come to London, i want to see the person who cooks this food, she is amazing. Jazaakaallah khayran both. Ramadaan Kareem sister. Thank you very much for the wonderful comment. We are happy you found the website useful. We will meet one day if God wills. May God bless you. Waan ku faraxnay inaad jeclaatay. Sheyga si kasto uu ufiican yahay waa laga xiisa dhacaa ee isbeddelka waa fiican yahay. Mahadsanid. Ilaahay ha ku jeclaado walaal. Aad iyo aad ayaan ugu faraxnaa xiriiriskiina iyo ducooyinkiina. Mahadsanid. Aamiin walaal. Adigana qayr badan ayaan kuu rajaynaynaa. Mahadsanid aad iyo aad. Thank you so much for your kind words, and thank you for your confidence in us. God bless you. aniga aad ayaan u xiiseeyaa webkan subaxwalban anoo nan booqan shaqada mabillaawo, alle ka sokow waxaa mahadleh dhalinta isku howshay in ay saacidaan walaalahood meel walba ee joogaan,waxaan codsan lahaa toorto oo lasharaxaayo inaad na tustaan waa haday suura galtahay mahadsanidiin. Aad iyo aad ayaa ugu mahadsan tahay faallada fiican. Waan ku faraxnay inaad jeclaatay goobta Xawaash.com. Hadduu Eebbe idmo waan ku tala jirnaa inaan soo gelino toorto sida loo sameeyo. Linkigaan waa toorto shakulaato http://xawaash.com/?p=6344. You guys are doing an amazing job and we all appreciate all the hard work that you guys put on every time I am a big fan of all of you and this website if you guys could help me little I wanted to know what brand is your pizza stone and where did you guys buy it. Thanks jAZAAKA ALLAH QAYR. Thank you very much for your kind comment. We are happy you like the website. We bought it from Vincenzo an Italian food store. Any brand will do; don’t buy the very cheap ones, and you don’t need the expensive ones too. We paid $35 and have been using it for more than 4 years. We wish you all the best. Walaal Zamiira, aad iyo aad ayaa ugu mahadsan tahay faallada qaayaha leh aad inoo soo qortay. Waan ku faraxsan nahay inaad ka faa’iidaysanaysaan. Hadduu Eebbe idmo waan ku tala jirnaa inaan soo gelino muufada birtaawada lagu sameeyo. Mahadsanid walaal. We have other things on the list for Eid. God willing we will post chakulata in the near future. Thank you for your patience. Mashallah! Those look amazing! You guys really know how to cook. Can you please invite over for dinner? Just kidding. You are welcome! Thank you for your nice comment. Thank you very much sister. We are very happy you and your daughters like the recipes. God willing, we will post garlic sauce. Eid Mubarak. I love your videos! The music is good and you demonstrate different ways of making this. I want to make this. thank you! Let us know if you like it. Thank you very much for your kind comment. You are most welcome. We are very happy we could help. Thank you for your nice comment. Waxaan halkaan uga Mahadcelinayaa dhaman Asxabta Cilmigaan noo faa’idaysay ee Khubarada Xawash.com.. Intaas kadib Waxaan jeclaystay in Hal item ee aan garan wayay idin waydiyo, Waayo waxaa laga yaba in aan Gobolka aan jogo sikale loogayaqan ee gudaha Dalka Hooyo..
Adigaa mahadda mudan walaal. Aad iyo aad ayaa ugu mahadsan tahay faallada wacan aad dalka hooyo inooga soo qortay. Baqduunis wuu ka-duwan yahay kabsarada, wuu ka-caleema weyn yahay, caraftana isku mid ma-ahan. 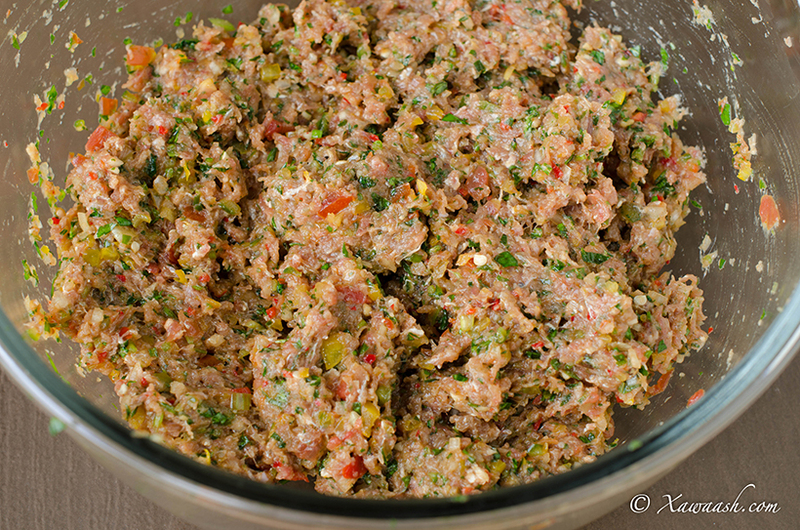 Afka Ingiriiska waxaa loo yaqaanaa “parsley,” af Carabigana waa بقدونس. Haddaadan heli karin kabsaro ayaa isticmaali kartaa. Aad iyo aad ayaa ugu mahadsan tahay faallada wacan aad inoo soo qortay. Waan ku faraxsan nahay waxa yar aan qabano inaad u aragtay wax qiima leh inay yihiin. Waxaa jira ereyo badan oo aan annaga af Soomaali ku aqoonin oo aan ku qasban nahay inaan af Carabiga ama af Ingiriisiga ka amaahsano. Tusaale ahaan af Carabiga ereyo badan oo ku saabsan cuntooyinka waxay ka soo qaateen af Ingiriisiga sida babriika بابريكة (paprika) beekin baawder بيكنج بودر (baking powder) iyo ereyo kale oo fara badan. Soomaaliyeenta ereyada cunto kariska waa mashruuc aan u baahan nahay inaad nagu kaalmeysaan, iyo waxa aad nooga aqoon roon tihiin inaad nala wadaagtaan. Waagii hore waxaan isticmaali jirnay ereyga buhaaraat (waxyaabaha cuntada lagu carfiyo). Waxaad inoo sheegteen in ereyga saxda ah uu yahay geedo, ereygaas oo aan hadda isticmaano. Waxaan idinka codsanaynaa wixii aad aragtaan inaan ku qalddan nahay inaad inoo saxdaan. Ra’yigiinana waan tix gelin doonnaa. Mahadsanid. Salama calaykum waalaal markasta waan galaa website kan qiimaha badan wax badan ayaan ka faa,iiday ilaahay ajar ha idinka siiyo. Aad iyo aad ayaa ugu mahadsan tahay faallada fiican. Hadduu Eebbe idmo waan soo gelin doonnaa. Tell us how it is different so we can help you.